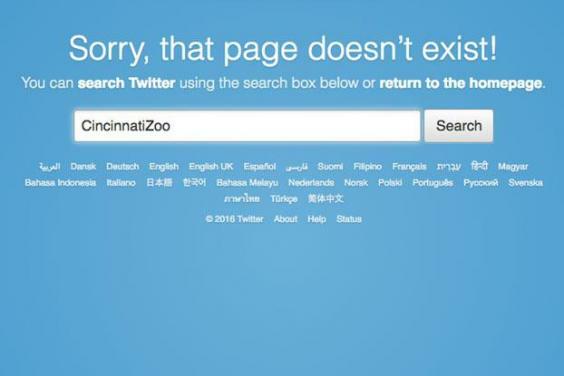 The Cincinnati Zoo essentially quit social media on Monday, deactivating both its Facebook and Twitter pages after the recent flood of Harambe memes and jokes became seemingly too much to handle. We are not amused by the memes, petitions and signs about Harambe. Our zoo family is still healing, and the constant mention of Harambe makes moving forward more difficult for us. The decision to take a hike from social media follows a strange and, some might say, hilarious period during which the memory of Harambe took a life of its own. When the world was first introduced to Harambe the Gorilla, the day he was shot by Cincinnati Zoo personnel when a 3-year-old boy entered the animal's enclosure, there was widespread outrage over the killing. Over the past few months, however, Harambe has become a sort of sarcastic punchline that has been used in just about any way imaginable. Simply put, Harambe's been everywhere. He's in athletes' Twitter mentions. Who knows, he might even be in this poor guy's email inbox. And if the latest reactions on Twitter are any indication, the memes are not going to stop. These reactions all come as the zoo staff insists they're trying their best to move past the issue. We are honoring Harambe by redoubling our gorilla conservation efforts and encouraging others to join us. Well, whatever strides the Cincinnati Zoo is making, it looks like it's going to take a lot more effort to make people forget about Harambe.